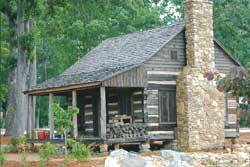 The 206 year-old Log Cabin settled down to reside on the campus of the Mauldin Cultural Center in the fall of 2005. Dating from the early 1800’s, the cabin was originally known as the Gosnell House and was a part of Camp Old Indian from 1940 until the fall of 2005 when it was moved to Mauldin. It was formally dedicated on December 7, 2006. The Blue Ridge Council of Boy Scouts gave the cabin to the Mauldin Cultural Center Foundation. It was dismantled, gently transported and reassembled at its new location. There it was furnished and decorated as it would have been in the 1800s. The cabin features period furniture, bedding, bowls, toys, and clothing. It fits the mission of the Cultural Center to educate the visitors of today and celebrate the past. The Log Cabin, landscaped with a water feature, Foot Bridge, and five interpretive gardens is one of the oldest buildings in Greenville County.